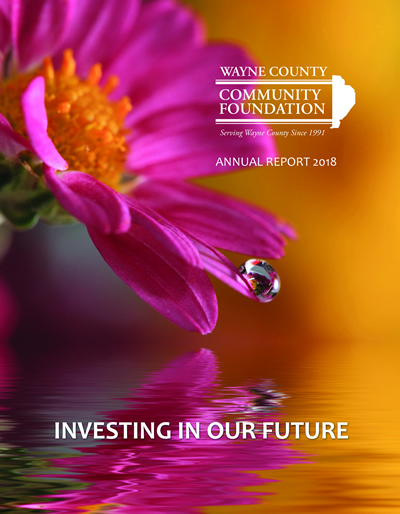 In 1991 a group of concerned citizens saw the need to establish a Community Foundation for Wayne County. Unlike the big national charities, they wanted to establish a charitable organization with deep roots in our community. They wanted to be the ‘one stop shop’ for fund raising, grant development, and student scholarships for Wayne County. They wanted to serve the needs of the entire county creating a place where a variety of long and short range causes could be met and a place where donors could create specific gifts to target their own concerns and interests…And finally, the Foundation wanted to create a critical mass of funding that had the potential to benefit for years and years to come….gifts that will give back…forever! Over these past 16 years, individuals, families, businesses and organizations have created a variety of permanent charitable funds that help the county meet the challenges of changing times. The Foundation invests and administers these funds and uses the returns to award grants, scholarships, and promote programs to a wide variety of humanitarian, educational and cultural organizations. The Foundation is listed as a charitable organization under 501c(3) of the Federal Tax Code. We know our community. When you choose to invest in the future of our community, you want to work with people who know the county, its organizations, its schools, its citizens…its needs! The Board and Staff have deep roots in the community and have many, many years of devoted community service! We help you achieve tax benefits. Since the IRS considers us a public charity, contributions are eligible for the highest available tax deductions. In most cases, these tax benefits outweigh using your assets to establish your own private foundation. We make set-up and administration easy. Establishing a fund can be done in less time than it takes to open a bank account. We take care of all the administrative and grantmaking activities, eliminating the need for you to set up a separate institution, formulate policies, file innumerable forms and monitor the status of grant recipients. We save you precious time and money. We share your interests. We are here to help you become connected to the issues you care about most. Your charitable interests and priorities are important to us because committed, caring citizens are so important to our community’s well-being. We care about the future. By setting up a fund, you have the ideal opportunity to create a legacy for yourself and for our area.